One of the smallest rodents in the world. Like a mix of mouse / chicken or something. Is this some sort of scientific experiment? That is a rodent from outer space. They came to Earth in little fluffy yellow UFOs that look like tennis balls. a cute freak of nature. Is it just me or does it look like in the last 10-15 secs that it's going to rip your throat out???? 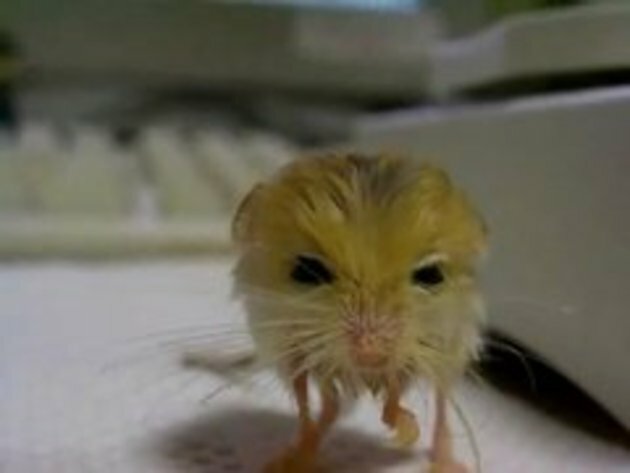 It looks like a mix between a chick and a mouse! ......#2 i agree with u wtf is that..... is it a mouse kangaroo? Its obvious that he is quietly powering up to super 2 near the end. Aaah, so this is where they got the idea for pokemon! WTF?...when I first saw it, I thought it was a toy...never saw anything like it...it's cute and ugly at the same time...lol. I love the feet...lol. Too cute. Loved when it fell of the scale. Holy Mackerel! It doesn't even look real! Looks like a cartoon character or something! Is that a poke'mon ? ? When you look at it head-on, it's bad haircut reminds me of Donald Trump. Looks like half bird half mice. Nice.